Okay, so technically I’m cheating today. Go Get ’em is really another location for G&B Coffee. They serve the same coffee from carefully selected roasters the world abroad, and make the same delicious specialty drinks. There is one huge difference between the two locations though… FOOD! Go Get ’em serves both breakfast and lunch so it really is more of a one-stop-shop in the coffee scene. Although I have yet to try any of their edible items, I already have my to-do list on deck: the brioche toast with berries, ricotta and honey, a churro waffle with bittersweet dipping chocolate, or their open-faced smoked trout sandwich are just a few that I look forward to getting in my belly. Inside of GGET the bar is a walk-up just like G&B. There’s seating along one of the walls and next to the front window. An iconic astronaut floats on the wall behind the bar (because what they do here is real sciencey)! They are located in one of my favorite LA neighborhoods so I give GGET bonus points for that. It’s a little area in mid-city called Larchmont Village. There are lots of shops and restaurants along the street, including one of my favorite ice cream shops Salt and Straw. If you like ice cream, you must come here after you grab some coffee from GGET! The offer some of the most interesting (in the best way) flavors that you might have never thought of, and they execute them perfectly. Today’s coffee stop is located on the outskirts of Chinatown. In a mostly industrial neighborhood, there is a small strip mall with a couple Thai restaurants and Chimney Coffee House. The first thing I noticed (and was truly thankful for) was the ample FREE parking. After being in LA for a while, you learn to appreciate the little things. Once inside, things just got better. The vibe inside of Chimney is a lot like something you would find in Koreatown without all the bustle (at least before 10 am). A couple group-sized and a few two-person tables are all the seating available. Popular music softly plays over the sound system, and there is almost an entire wall of windows letting in some of that California sun. The coffee bar and main counter take up a lot of the space, but it’s still a very open area. My favorite aspect was brick wall at the end of the cafe. At Chimney, they bake all their pastries in-house. Kudos to the pastry chef! The selection is a pretty big one too: croissants, danishes, muffins, breads, and scones are all your for the taking and they all look delicious. They also serve brick toast, which is a thick piece of toast filled and/or topped with ice cream, whipped cream, fruits, or just about any sweet you can think of. Their food menu includes burgers, sandwiches (hot and cold) and salads. The coffee they brew here varies, but is carefully chosen. They make everything from Bird Rock to Suites and Knives, and make it right, doing all their suppliers justice. There is free WiFi so feel free to bring your laptop and get some work done while you’re here. After all, with all the yummy options, you could be here for quite some time. This week’s coffee song is, “Let’s Have Another Cup of Coffee” from the musical Face the Music. It’s a reminder that even though things may be rough not to let it get you down. Just have another cup of coffee! Enjoy! When planning to do this series, I already knew which places I wanted to include in it, but when I came across Menotti’s I knew some changes had to be made. While meeting up with a friend in Venice, I made it known that I would be needing coffee if I were to be at all functional. I’ve already been to Blue Bottle, and Intelli, so I wanted to try something new. Old faithful (Yelp) led me to Menotti’s, and I’m so happy it did! Menotti’s is a small little coffee shop just off of the Venice Beach Boardwalk. It’s named after the original name of the Townhouse bar (which is currently next door to Menotti’s). Despite it being in one of LA’s most touristy areas, it still has a feeling of your friendly neighborhood coffee house. They use Four Barrel coffee, just like Dinosaur (here). There are vegan and organic coffee options to cater to the variety of customers that come through. There isn’t much space for hanging around inside, but there are a few stools and a table by the window. But when you’re just steps from the ocean, do you really want to stay inside anyway? Back in dtla, I visited The Classic Coffee after just roaming around one day. It’s actually situated right across the street from Verve (see here) and about a block away from Coffee Colab (here) at the edge of the Fashion District. Talk about a dilemma! Well, at least there’s a great selection to choose from in this area. Being the equal opportunist that I am, I like to rotate between them. 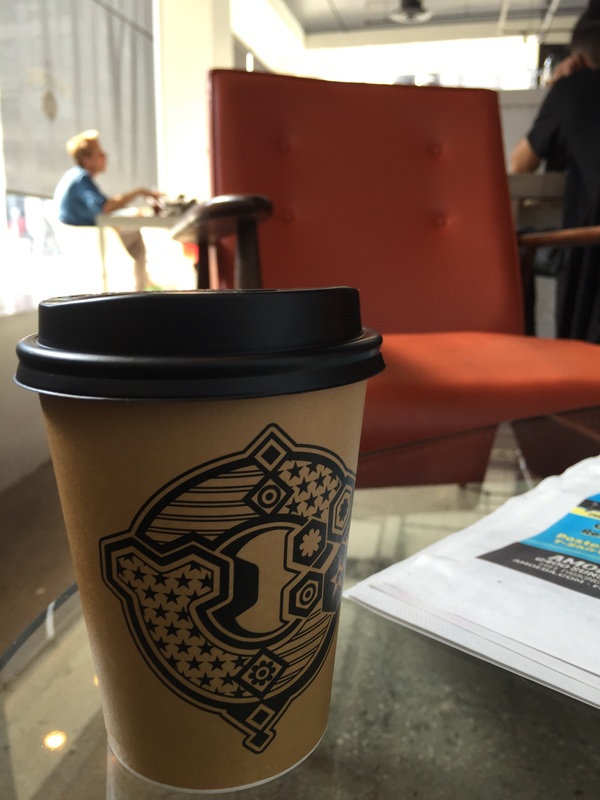 The coffee served here is from none other than Intelligentsia. The drink to try (so I’ve heard) is the “Fashionista”. It’s espresso with simple syrup and milk over ice. They also have Juice Love available which I have yet to try. A few pastries, and sandwiches to accompany your drinks can be purchased as well. The baristas are sometime dressed in bow ties and suspenders which touches a special place in my heart… not really sure why, but I have a thing for both accessories. Inside of Classic is a very open space with lots of natural light allowed by the floor to ceiling window on the south side of the building. The opposite wall is covered in plants. That’s right, they have a plant wall. I actually love how it goes with the atmosphere there. It’s a burst of color in a mostly white interior. The large red disks on the north wall aren’t just art, they’re speakers! The coffee bar is rather big compared to most other places I’ve been to, but there is bar seating along one side so it’s pretty functional. There are tables spread out inside and outside. In the back there is a kind of lounge area with bench seating around a coffee table, a couch, and steps adorned with pillows (and outlets so you can plug-in). There’s also bar seating all around the huge windows so you can look out and people watch (which is great in dtla). Overall a great space for coffee talk, work, or killing some time.